November 4th 2015 is a day Sixth Form student Georgia Parkes-Russell will remember with justifiable pride. 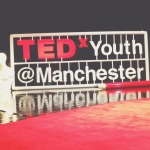 It is the day she represented The Winsford Academy at the seventh TedX conference to be hosted by The Fallibroome Academy. TED stands for Technology, Entertainment and Design. Many staff have seen a wide selection of Ted talks; Georgia was accompanied by staff and student supporters alike when she spoke on the subject of safeguarding the mental health of South African adolescents. It is to Georgia’s credit that, in addition to her A Levels for which she is studying, she is also working towards the completion of a course with the OU. Grateful thanks must be extended to Mr Rubery, Executive Principal of The Fallibroome Academy, for extending the opportunity and invitation. Once editing of the morning’s TedX Youth Conference is complete, a link to the riveting speeches and incredible musical performances will be shared.